Earlier, fans of industrial rock pioneers, Nine Inch Nails, got a rare and exciting opportunity to watch streaming footage of the band’s return to the stage after four long years. The Fuji Rock Festival in Japan, where NIИ kicked off their comeback tour, featured the debut of two new songs entitled “Copy of A” and “Find My Way” from their brand new album, Hesitation Marks, due out September 3, 2013. Earlier this year, frontman/producer/songwriter/instrumentalist Trent Reznor announced the re-configuration of Nine Inch Nails for this summer’s tour. 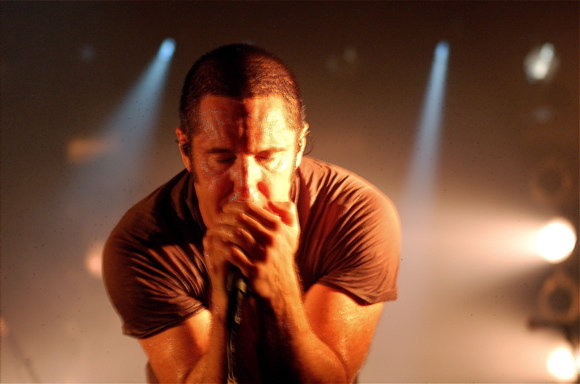 While NIИ is no stranger to new and different musicians, having had nearly two dozen different live touring members, Reznor remains the only constant member of the band since it’s inception in 1989. This tour marks the departures of bassist Eric Avery and guitarist Adrian Belew, and the highly anticipated reunion of guitarist Robin Fink with the band. These tracks come from the new album Hesitation Marks, which has been reported to feature the talents of Lindsey Buckingham of Fleetwood Mac, an announcement that is delighting fans with unexpected anticipation. The album itself, in true Trent Reznor fashion, will be released with no less than four separate album art covers. The first single, “Came Back Haunted” is being met with acclaim by both critics and fans alike, being hailed as “five and a half minutes of irresistible techno-funk” by Gary Graff of Billboard.com and scoring an 83 Billboard rating (read the article here). The music video, directed by mind-bending cinematography titan David Lynch, features flashing black and white images and brief flashes of an entire bright red screen comes complete with an epilepsy warning, so viewers beware while watching this video. Check out the full set list from the Fuji Rock Festival, and watch out for Hesitation Marks on September 3, 2013. You can find Nine Inch Nails albums on Amazon.com.